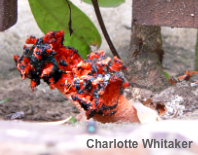 Also known as Kalchbrennera corallocephala, this African stinkhorn is pretty unmistakeable. 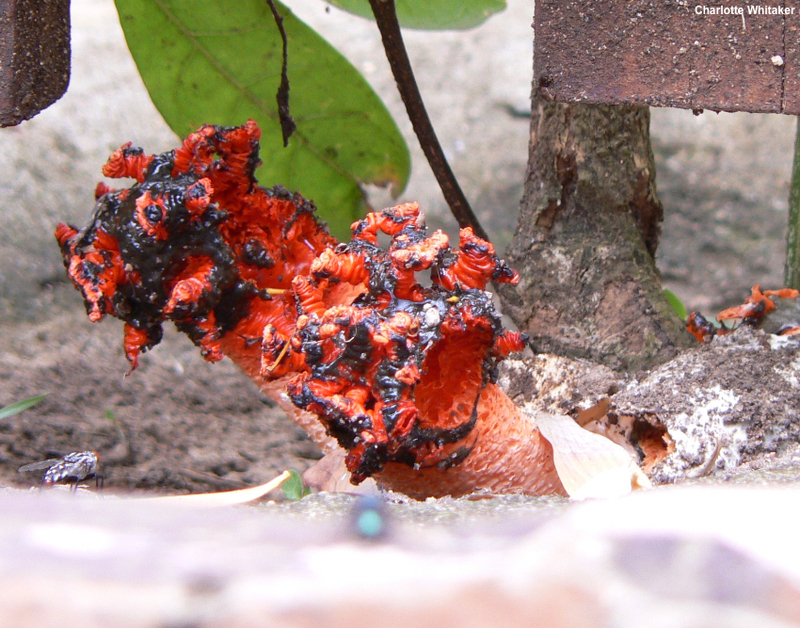 It features a whitish to pinkish stem that terminates in a gnarly set of stubby red branches that are covered with, and appear to emerge from, an oozing dark brown mass of spore slime. 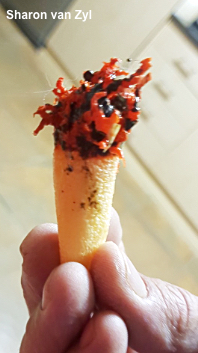 Overall, Lysurus corallocephallus has the appearance of a twisted, aborted form of Aseroë rubra. I have not collected Lysurus corallocephalus, nor has anyone sent me material to study. But I would love to study it! If you have found this amazing stinkhorn and would like to help out, please let me know at . Thanks to Charlotte Whitaker, Robin Mountford, and Sharon van Zyl for sending photos of Lysurus corallocephalus, and for permission to reproduce the images here. Note: Since I have not collected or studied this mushroom, the description is based on the sources cited below and the photos sent to me. Ecology: Probably saprobic; growing alone or gregariously in a variety of habitats (Dring  lists the following for specimens examined: "on soil in maize field," "under Pithecolobium," "Old Calabar botanic garden," "in Acacia xanthophaea woodland," "Bamboo forest c. 7000 ft," "edge of cultivated field and natural woodland," and "in grass"); subSaharan Africa; found year-round. Fruiting Body: At first a pale "egg" up to 4 cm across; emerging to form a stem and a head. Stem up to 12 cm high; more or less cylindric; hollow; whitish to yellowish, pink, or reddish; spongy; arising from a whitish to pinkish volva. 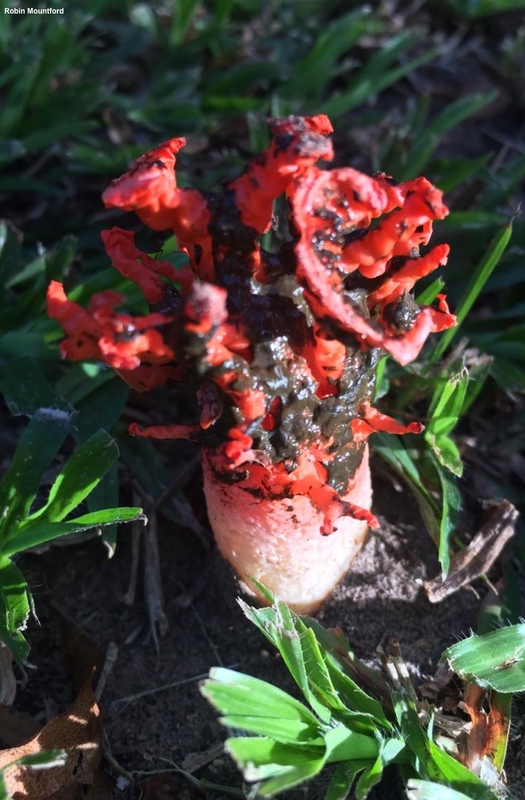 Head scarlet, with protruding branches arranged around polygonal meshes; the branches simple or forked; up to 3 mm wide and 2 cm long; accordion-like when fresh; covered with olive-brown spore slime. Microscopic Features: Spores 3.5–4.5 x 1.5–2 µm; more or less ellipsoid.